USS Perch (SS-176) was a Porpoise-class submarine that has an interesting and known history of how it was lost. We know exactly how the Perch was lost because the crew was ordered to abandon ship on 3 March 1942 due to excessive damage done. The crew were picked up by the Japanese and taken as prisoners, and all but six survived the Japanese POW camps. On 23 November 2006, a dive group led by Vidar Skoglie found USS Perch in the Java Sea north-northwest of Surabaya City, Java, at a depth of 190 feet. The Perch was found by accident by the divers, but it was still a happy occasion. In December 2006, diver/photographer Kevin Denlay sent numerous photos of the wreck to Bowfin Park. Her identity has not yet been confirmed by the U. S. Navy, although physical evidence of the vessel’s identity appears conclusive. 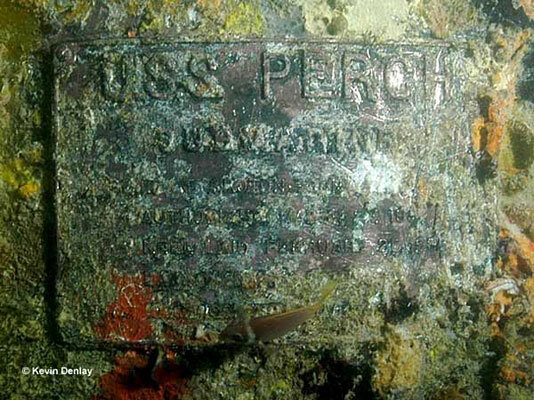 The divers found a plaque, pictured, with the name “USS Perch” with detailed information about the submarine. Bowfin Museum proudly displays the wonderful footage of the Perch wreckage courtesy of Kevin Denlay. Former President George H. W. Bush was rescued by USS Finback (SS-230) after his aircraft went down near Chichi Shima on 2 September 1944.